The Women’s Chamber of Commerce Nevada recently presented Eloiza Martinez with its Minority Lifetime Achievement Award for her contributions to the community. 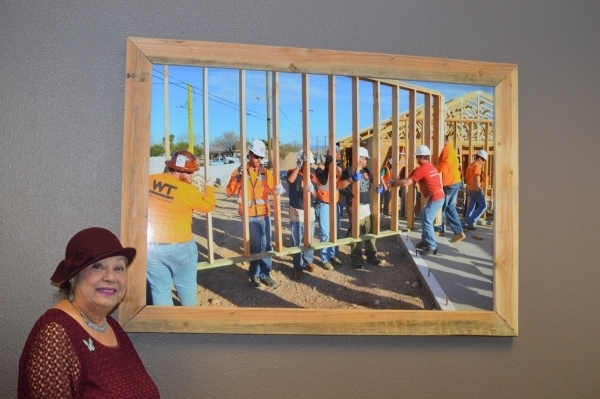 Martinez has retired from Wells Fargo Bank but she has retained her interest in small business success as a philanthropist. It is her desire to assist others that sets her apart. She is an example for others aspiring to teach others, cultivate relationships and in general improve the community. Q. What nonprofits have you been with the longest? A. Habitat for Humanity. I’ll be completing my 25th year next year. I was a founding member. Nevada HAND (Housing And Neighborhood Development) is another organization; they do senior housing. Mike Mullin. I’ve been with that board 22 years, served in every capacity from board president to vice president. Right now, I’m the secretary. They do all senior housing and then they have two sites where they have assisted living. I’ve been with Mike since the infancy and it’s so rewarding. The Latin Chamber of Commerce. I was with them since 1982. I was their president. After my term, I decided the executive director needed to president and CEO, so I talked to all the rest of the board members — the 27 board members. The office manager, Athena, she needed a new title and that was approved, and we’re still friends. They’re going to be retiring next year. It was a very good stretch. Q. You have spent many years focusing on helping minority-owned businesses and helping people coming out of prison. Why did you choose that particular realm or niche as a focus? A. Because they needed somebody to really guide them. In the minority loan businesses, I remember when I was with the bank — Wells Fargo — my niche was in the Latin community. In North Las Vegas, there weren’t that many cars; people just walked. They were sheltered in their own little place. So I started to look at the vicinity and so I went to the (bank) president. I said “we’re missing the market.” They said “why?” I said, “I don’t see why you don’t put a branch inside the Spanish/Latin market — Cardenas or Super Mercados or something. … They thought about it and came back. … Sure enough, we had a Wells Fargo inside Super Mercados. Eventually they closed, but Cardenas is still open. Q. What do minority businesses need both now and in the future? A. I really think that they need more education, whether it’s financial literacy or to what sources, how to really run a business. In the small businesses, they just start because they have an idea. They really have not researched it. And this is what’s lacking. I believe these people need that opportunity to show them, to educate them. They need to be given the information so they can take advantage of it. Q. Should the finance classes you began now be taught to small businesses? A. I definitely think so, right. You don’t realize, just because you have a checking account doesn’t mean you have money in the bank. You need to know how to balance it. You need to know when to use it. You do not have a savings account and checking account but then start taking out of saving. What’s the use of having a savings account? A savings account is for the purpose of saving and a checking account is an everyday transaction and people don’t seem to understand that. Especially, people from Mexico and maybe other foreign countries, they don’t have checking accounts, so they don’t know. Q. How did the financial literacy class you started progress? A. (At Well Fargo,) they would have to take the class, first so they would understand. It was up to me to make it work. And if they had a bounced check, the manager would come right to me. “I’m not going skip this fee; this person needs to have class again. And, I’d re-give them the class and let them know what was happening. That’s the only way. And that’s what I mean about financial literacy — they need to know. At Habitat for Humanity, we have financial literacy class. It’s one day a week. We go through the book and the exercises and they do very good. Q. How did you get involved in prison volunteer work? A. I was always involved in nonprofits. When I was with the bank, I had a special job — development officer, vice president for Wells Fargo — and my niche was to go into the prison systems and teach financial literacy. I did it in High Desert, Low Desert, Casa Verde, and Spring Mountain Youth with the kids — the ones that get into trouble, from 12 to 17 — Women’s Prison. Q. What do find rewarding about the volunteering experience? A. I sort of enjoyed that because I had their attention. And sometimes people that are involved like that do not get attention. And I was surprised, though I shouldn’t be surprised, they are very smart people. How they got into that system is beyond me and it’s not for me to make judgement. But, very smart people, they did their homework, they looked forward to me coming the next week. So to me, it was very rewarding. Q. Who has shown you that the programs work? A. Right now, I’m mentoring a young lady that came out of High Desert, the women’s prison, and she’s doing so great. Now, she’s got a job; she went back to school; she’s going to transfer from community college to go to UNLV; has a car. Amazing, so we keep in touch. So to me, that’s rewarding. Q. Reflecting on the lifetime achievement award, what are you most proud to have accomplished? A. I believe the thing that I’m most proud of is that I have very good friends. I may not know anybody; I may go to an event; and by the time the day is over, they know me and I know them. I have a knack for remembering people. So, it’s a communicating factor. I must say I have very good friends. Q. What message did you give them for your acceptance speech? A. Keep doing good things for the community because it enriches your life. When we leave this earth, we don’t take anything we have to share. That’s my feeling, that’s my saying.